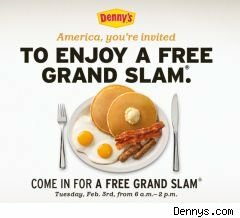 During its Super Bowl ad last night, Denny's announced that it would be giving away a free Grand Slam breakfast -- inconveniently named for the subject of a Super Bowl promotion, but hey -- to anyone who visits its locations on Tuesday, February 3 between 6 a.m. and 2 p.m. You'll also be able to "Slam It Up" by adding any two additional items for 99 cents each. "The Grand Slam has always been a Denny's favorite," says Nelson Marchioli, CEO of Denny's. "This free offer is our way of re-acquainting America with Denny's real breakfast and with the Denny's brand. You don't know the real Denny's unless you've been in our restaurants lately, experiencing the quality of our new menu items and our service first-hand." Denny's estimates that it will give away two million breakfasts as part of the promotion. The company will be looking to convert the freeloaders into repeat customers by also offering coupon books with the Grand Slams. This promotion is certainly a publicity generator, but I have to wonder: What kind of impact will two million free breakfasts and two million free coupon books have on the company's profitability? Shares of Denny's are up nearly 6% the day after the Super Bowl commercial and the announcement of the promotion. If you do decide to take advantage of this offer, be sure to block out some time for exercise. Examiner.com reports that the Grand Slam breakfast contains 795 calories, 50 grams of fat, 65 grams of carbs, 34 grams of protein and just 2 grams of fiber. My WalletPop colleague Tom Barlow has crunched the rest of the numbers and come up with some good news for Denny's. Tom has found out that according to the company's Annual report, there are 1,152 Denny's seating an average of 140 people per. If we assume an average of a half-an-hour per diner, then in an eight-hour window the restaurants could serve a maximum of 2,580,480.